This was first published in 1946 by Collins Crime Club. This edition, published in association with the British Library, has an introduction by Martin Edwards, and it has a beautiful cover. The Second World War is drawing to a close. Nicholas Vaughan, released from the army after an accident, takes refuge in Devon – renting a thatched cottage in the beautiful countryside at Mallory Fitzjohn. Vaughan sets to work farming the land, rearing geese and renovating the cottage. Hard work and rural peace seem to make this a happy bachelor life. On a nearby farm lives the bored, flirtatious June St Cyres, an exile from London while her husband is a Japanese POW. June’s presence attracts fashionable visitors of dubious character, and threatens to spoil Vaughan’s prized seclusion. When Little Thatch is destroyed in a blaze, all Vaughan’s work goes up in smoke – and Inspector Macdonald is drafted in to uncover a motive for murder. E C R Lorac was a pen name of Edith Caroline Rivett (1894-1958) who was a prolific writer of crime fiction from the 1930s to the 1950s, and a member of the prestigious Detection Club. She also wrote under the name of Carol Carnac, but she seems to have been a forgotten author and I hadn’t heard of her until quite recently, when I read Bats in the Belfry. 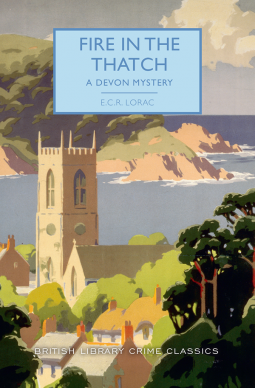 Fire in the Thatch is set in rural Devon in 1944 and the atmosphere of life in the Devon countryside is highlighted by Lorac’s rich description of the landscape, the traditional ways of farming and the characters. It shows the clear distinctions between the social classes and the tensions between them and the conflicting moral values of the town and country folk. She conveys the sense that change is on the way as the war moves towards its conclusion. The war forms the background to the book – June’s husband is a prisoner of war in Burma, evacuees have been billeted in the countryside and rationing, in particular petrol rationing (which plays an important role in this book) is making life difficult. The book begins in a leisurely way describing the isolated community of Mallory Fitzjohn and introducing the characters, Colonel St Cyres, his daughter Anne and daughter-in-law June living at Manor Thatch, and Norman Vaughan, a new tenant at Little Thatch, invalided out of the navy with damaged eyesight. Other main characters are Thomas Gressingham, a wealthy stockbroker and a friend of June’s, staying at Hinton Mallory, in the valley below Mallory Fitzjohn, and his friends Howard Brendon, a lawyer interested in buying property and Raymond (Rummy) Radcliffe, a ‘rotund’ speculator. And then in chapter 5 we learn that Vaughan’s body was found in the burnt-out debris of Little Thatch and Chief Inspector Macdonald of New Scotland Yard has been asked to investigate the case. From that point on the book follows his comprehensive and detailed methods of trying to establish whether his death was accidental and if not what could be the motive for his murder, and if indeed the dead man was Vaughan or someone else. Why had Vaughan, a north country man decided to settle in Devon and who was the woman he had indicated to the St Cyres that he intended to marry? All of Macdonald’s skills are needed to get to the bottom of this complex mystery which confused me right up until the end of the book. I preferred Bats in the Belfry, but Fire in the Thatch is still an enjoyable book. It’s just that Macdonald’s investigations seemed to drag on a bit too long, and I found it confusing as he described the details of how and when Vaughan had died. But I loved the setting and the characters. I do hope the British Library will publish more of E C R Lorac’s books – there are plenty to choose from as she wrote forty-eight mysteries under her first pen name, and twenty-three under her second, producing two books a year from 1931 until her death in 1958. Many thanks to Poisoned Pen Press for a review copy via NetGalley. I must keep an eye out for this one. My library has a few BLCC books and I suspect I could reserve more from other branches but to be honest I often grab one or two in Smiths when I’m in there or add one to an Amazon order as they’re such a joy to own. Cath, I think they’re definitely worth buying – the covers alone are just lovely! And the mysteries are a pleasure to read. I’m glad you enjoyed this one, Margaret. It sounds as though it has a very strong sense of place and time, and I always like that in a novel. And it’s good to hear the characters are well-developed. Thanks, Margot! Lorac is particularly good at describing the settings – both in this one in Devon and in Bats in the Belfry, set in London. Glad you enjoyed this one, since I’ll be reading it soon! Pity about the drag, but I’ll know to expect it now and adjust my expectations accordingly, so thanks! You may not find it drags! I hope you enjoy it too. Those detailed explanations at the end are helpful though for people like me who can’t seem to spot the clues that were obvious throughout to others. I suppose it’s just as well I never wanted to be a detective since I’d have been hopeless…. Those detailed explanations at the end are indeed helpful – it’s just that in this book I think I was being rather dim as it took me ages to work it out, even with the explanations. It’s very convoluted.